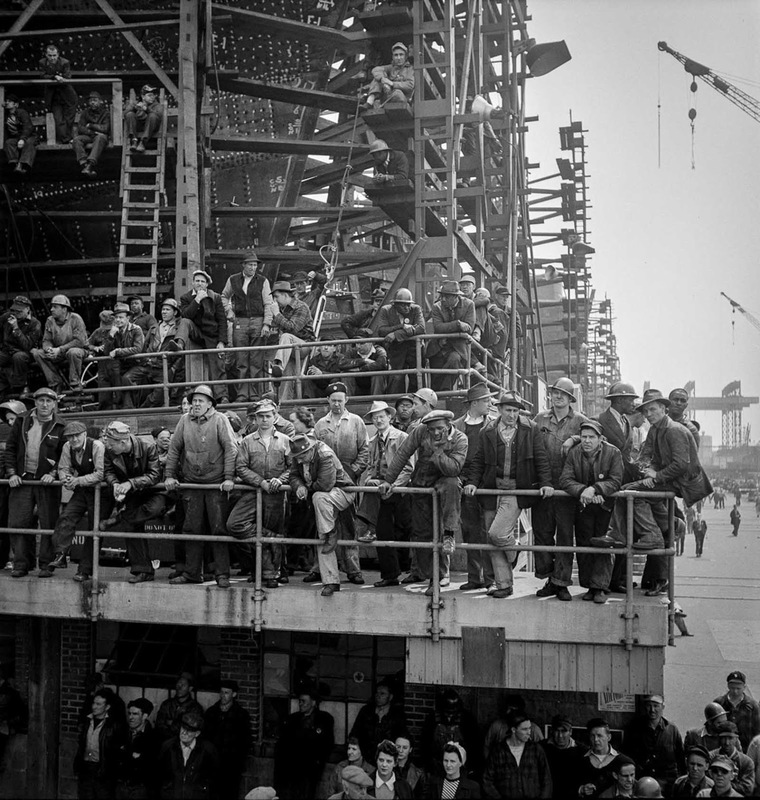 Workers gather to watch a launching ceremony. 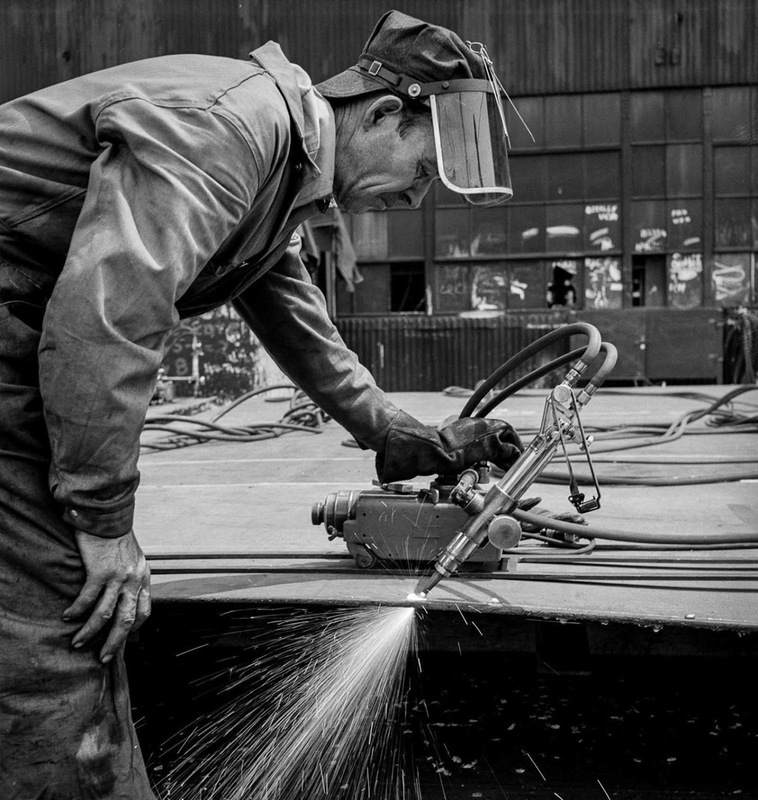 The Bethlehem-Fairfield Shipyard on Baltimore Harbor was established in February and quickly set 27,000 employees to work building these new “Liberty ships”. When war broke out Europe in September 1939, the American merchant fleet was caught unprepared to handle a massive sealift of war material. 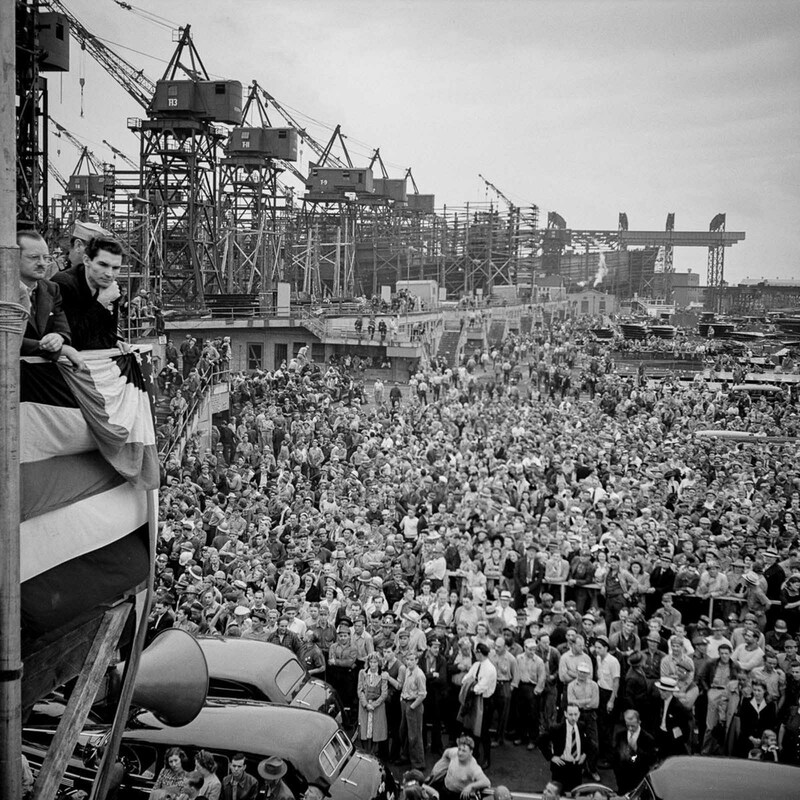 With continental Europe under German control, and Great Britain under devastating air attack, President Franklin Roosevelt decided to increase the pace of production to provide ships to America’s British allies. 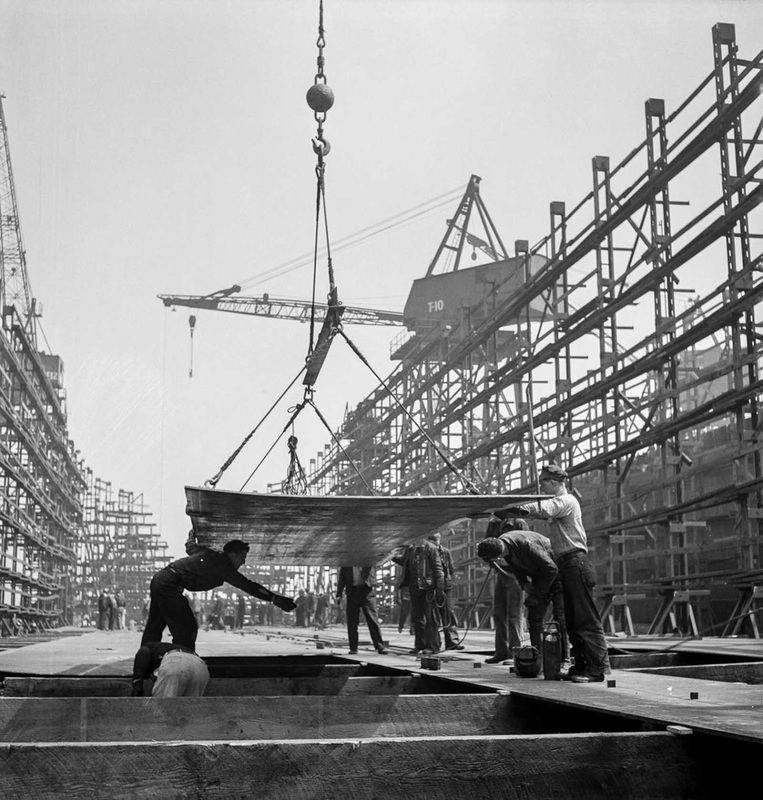 The result was the emergency fleet program, which introduced the assembly-line production of standardized ships – the Liberty ships – in 1941. The Liberty ship represented the design solution that would fill the need for an emergency type of simple, standardized cargo steamer. Based on a British design, it could be mass-produced cheaply and quickly using assembly-line methods and could easily be converted to individual military service needs. 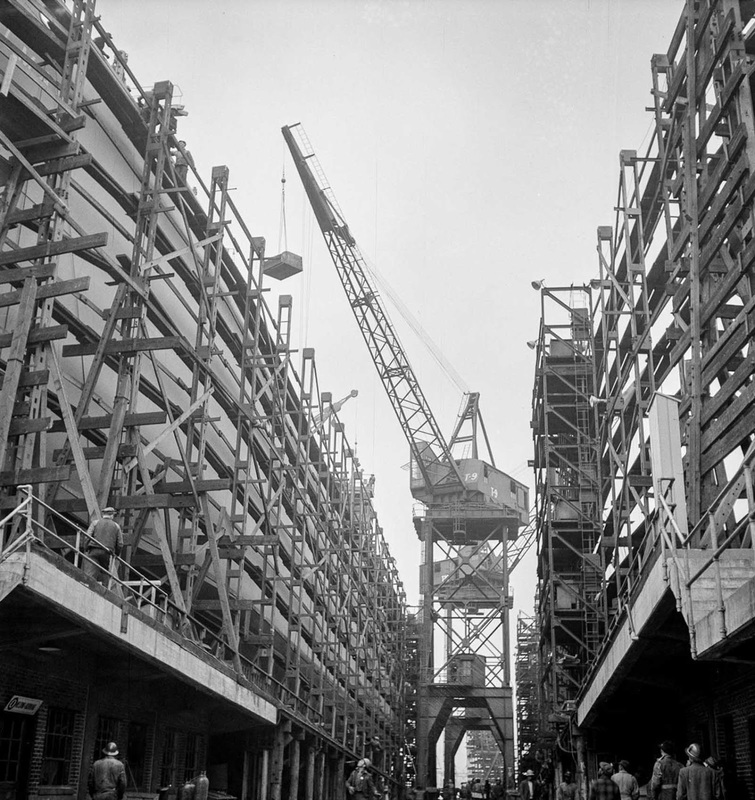 While reviewing blueprints of the Liberty ships at the White House, President Franklin D. Roosevelt, who loved naval vessels and had an eye for design, mused aloud to Maritime Commission administrator Admiral Emory S. Land, “I think this ship will do us very well. She’ll carry a good load. She isn’t much to look at, though, is she? A real ugly duckling”. Thus, the Liberty ships received their second nickname “the ugly ducklings“. Production speed grew more important as German submarines sank ships trying to break Hitler’s naval blockade of Great Britain. 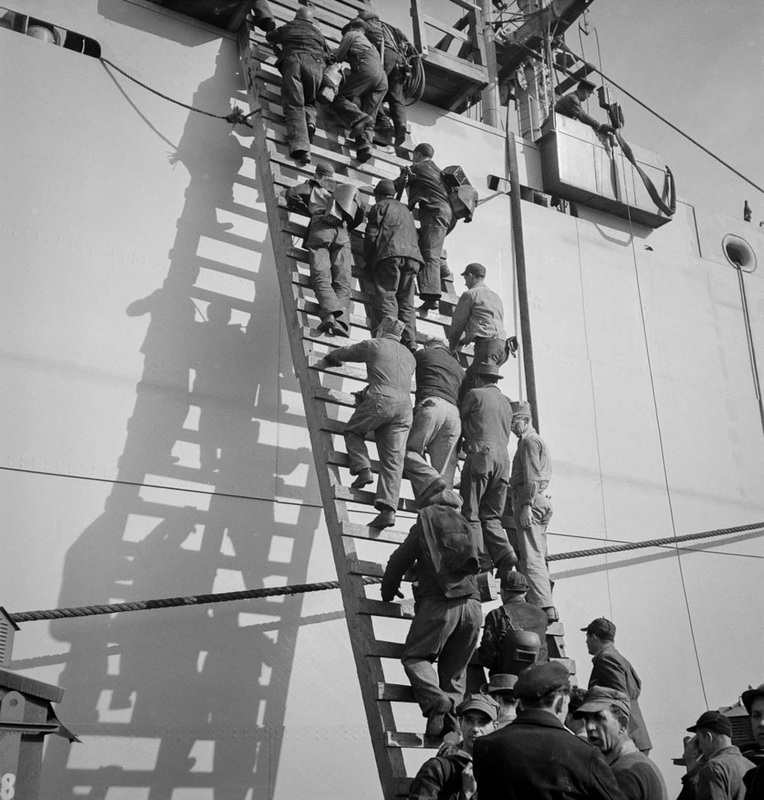 The Allies needed ships by the hundreds to replace these losses and to increase the flow of supplies to England and, later, the Soviet Union. Liberty ships at anchor await final fitting and rigging. 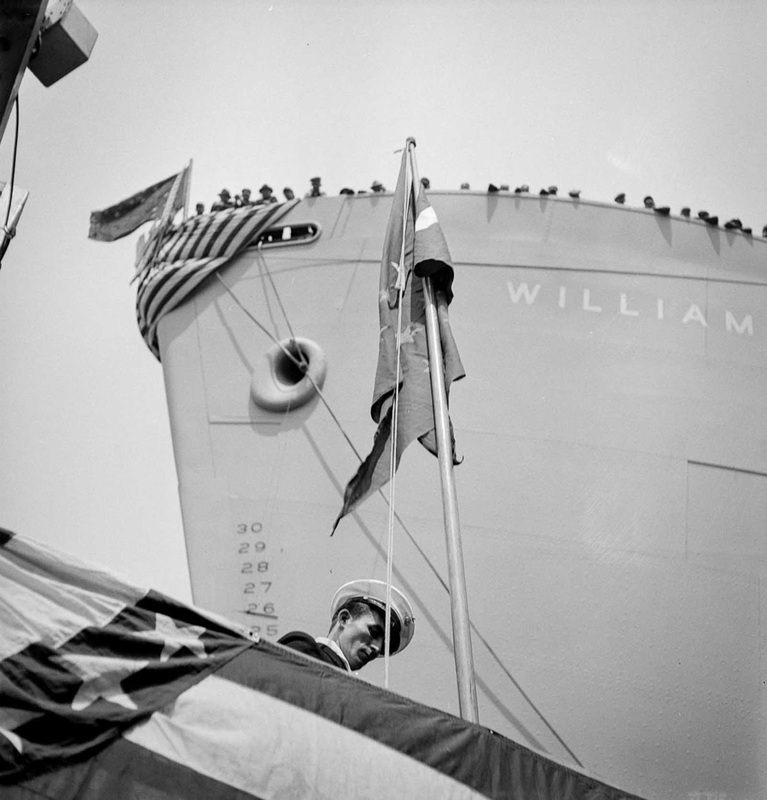 The first of these new ships was launched on September 27, 1941. It was named the SS Patrick Henry after the American Revolutionary War patriot who had famously declared, “Give me liberty, or give me death”. 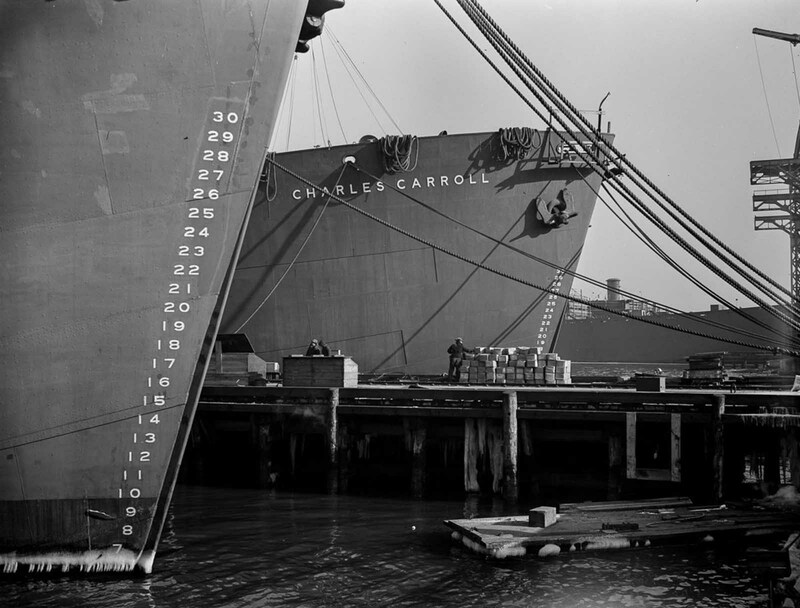 Consequently, all the EC2 type of emergency cargo ships came to be known as Liberty ships. Naming nearly 3,000 ships turned out to be harder than people thought. 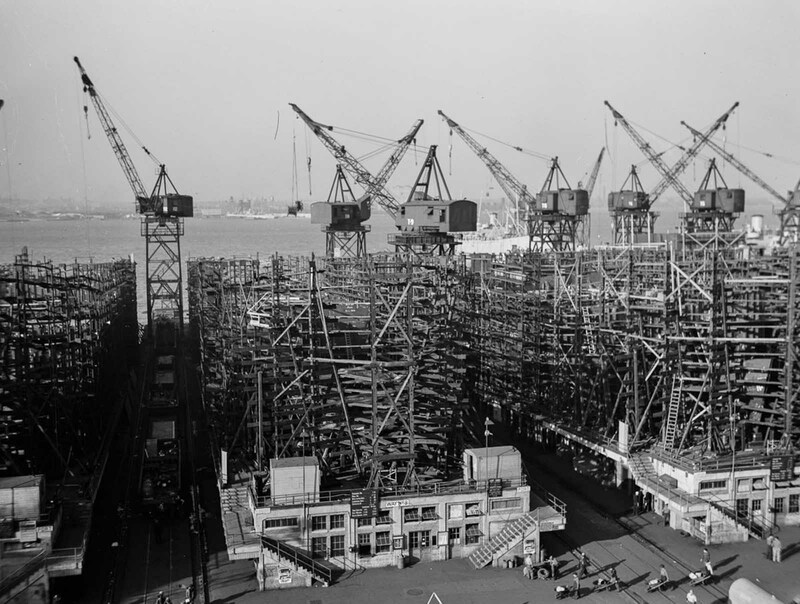 Unlike the later Victory ships, there was no plan for how the Liberty ships would be named. In the end, the Liberties were named for people from all walks of life. Ships were named after patriots and heroes of the Revolutionary War. They were named after famous politicians (Abraham Lincoln to Simon Bolivar), scientists (George Washington Carver to Alexander Graham Bell), artists (Gilbert Stuart to Gutzon Borglum who sculpted Mt. Rushmore) and explorers (Daniel Boone to Robert E. Peary). 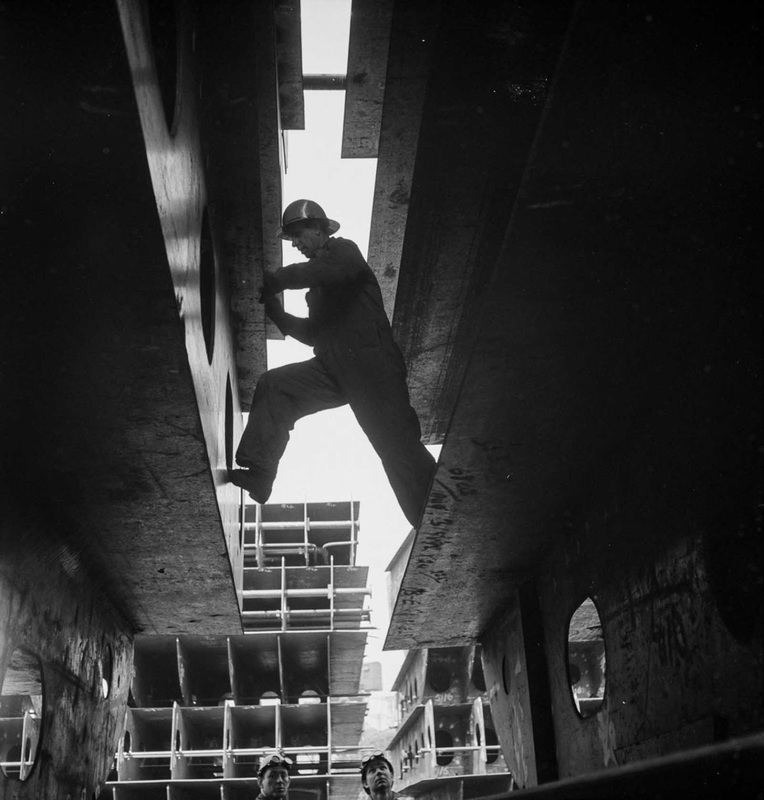 Workers climb a ladder on the outfitting pier. The Liberty ships were slightly over 441 feet (134 meters) long and 57 feet (18 meters) wide. They used a 2,500 horsepower steam engine to push them through the water at 11 knots (approximately 12.5 miles per hour). The ships had a range of 17,000 miles (27,000 kilometers). 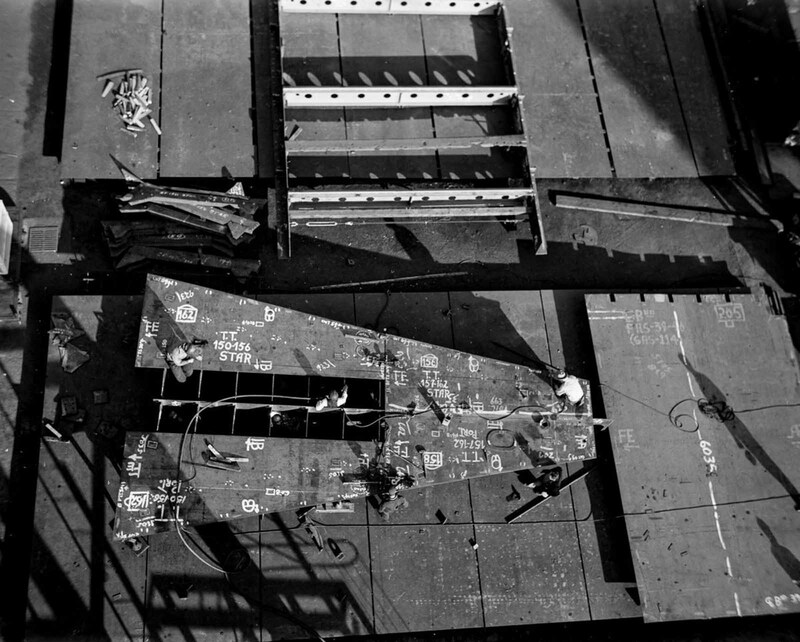 Liberty ships had five cargo holds, three forward of the engine room and two aft (in the rear portion of the ship). Each could carry 10,800 deadweight tons (the weight of cargo a ship can carry) or 4,380 net tons (the amount of space available for cargo and passengers). The crew quarters were located amidships (the middle portion of the ship). 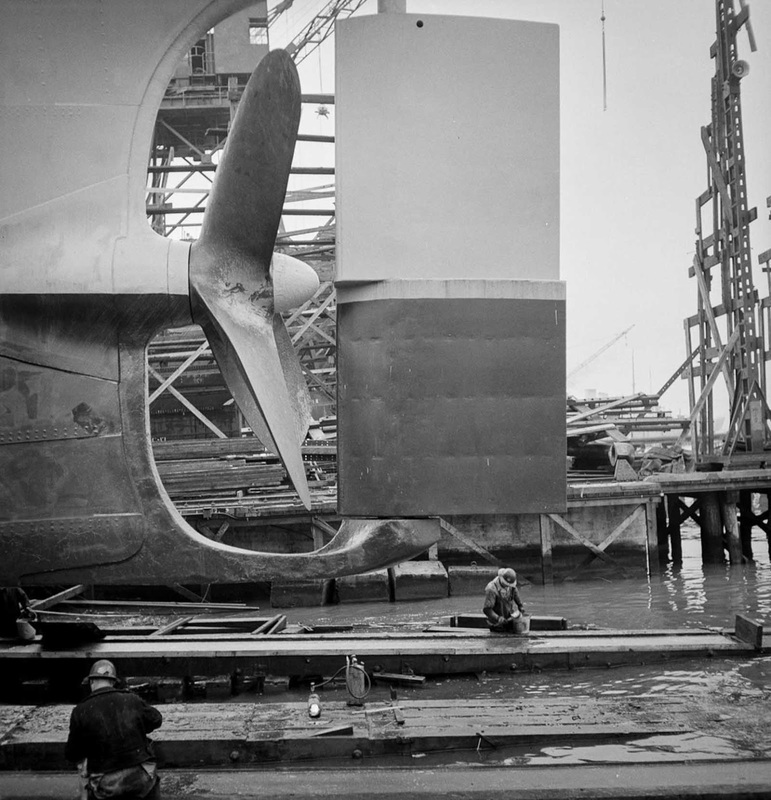 Many technological advances were made during the Liberty shipbuilding program. 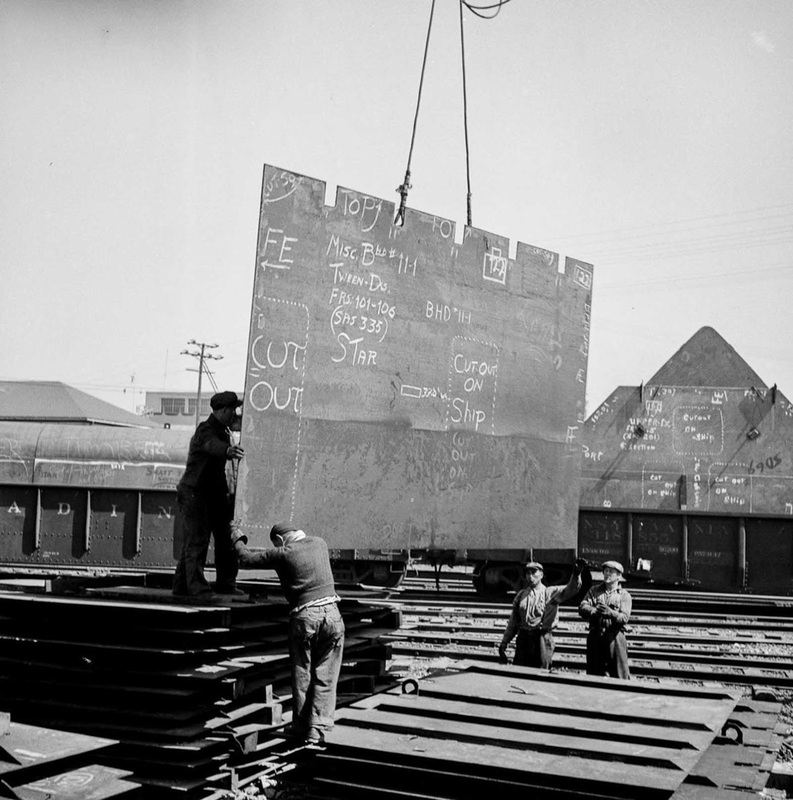 A steel cold-rolling process was developed to save steel in the making of lightweight cargo booms. 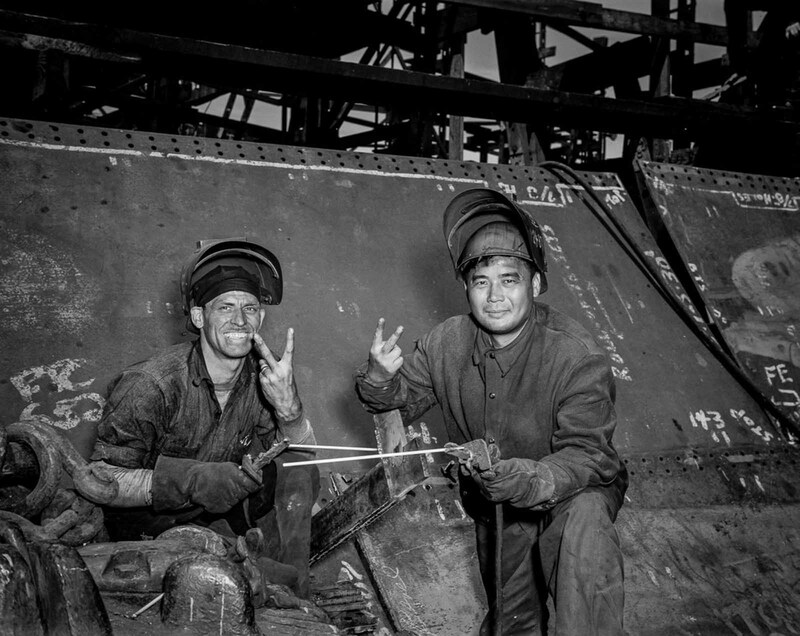 Welding techniques also advanced sufficiently to produce the first all-welded ships. Workers on line to start their shift. 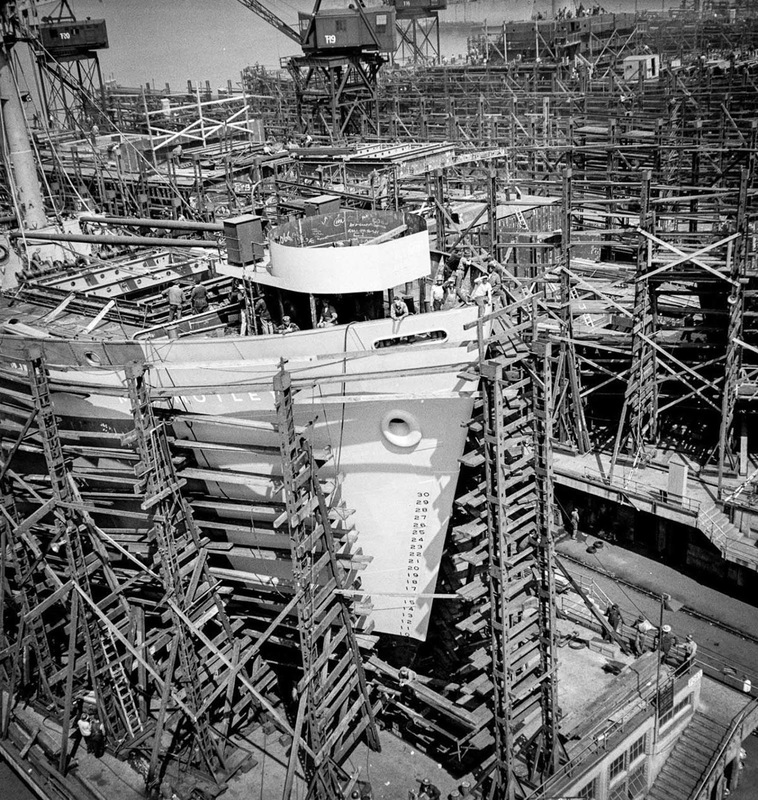 Prefabrication was perfected, with complete deckhouses, double-bottom sections, stern-frame assemblies and bow units speeding production of the ships. 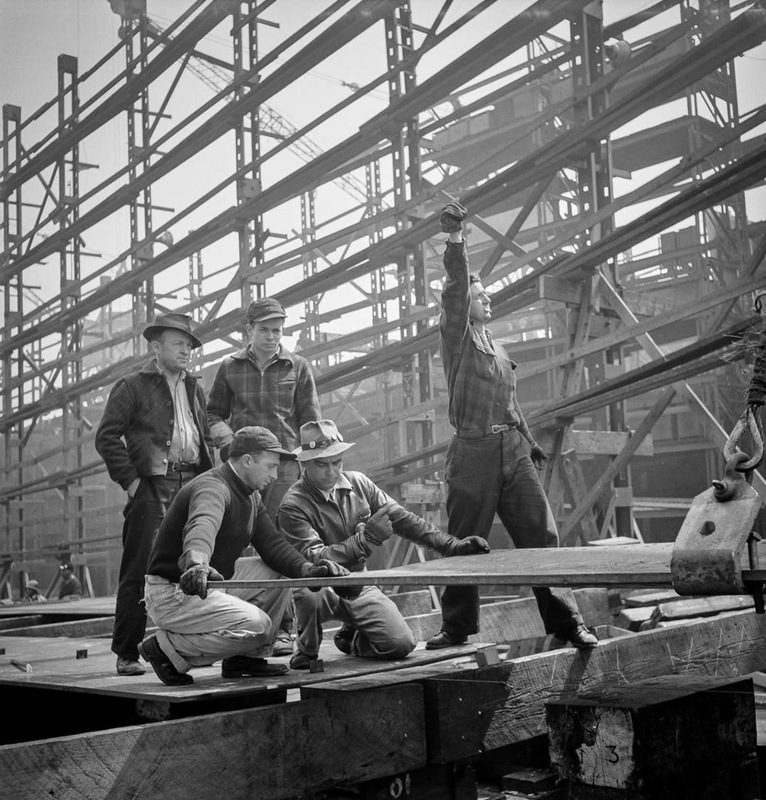 By 1944, the average time to build a ship was 42 days. 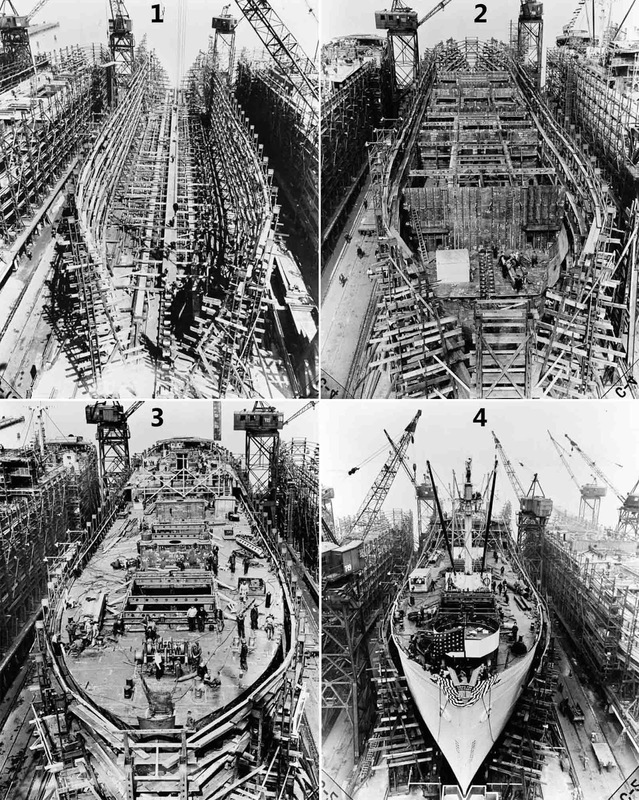 In all, 2,751 Liberties were built between 1941 and 1945, making them the largest class of ships built worldwide. The Liberty ship was considered a “five-year vessel” (an expendable, if necessary, material of war) because it was not able to compete with non-emergency vessels in speed, equipment and general serviceability. 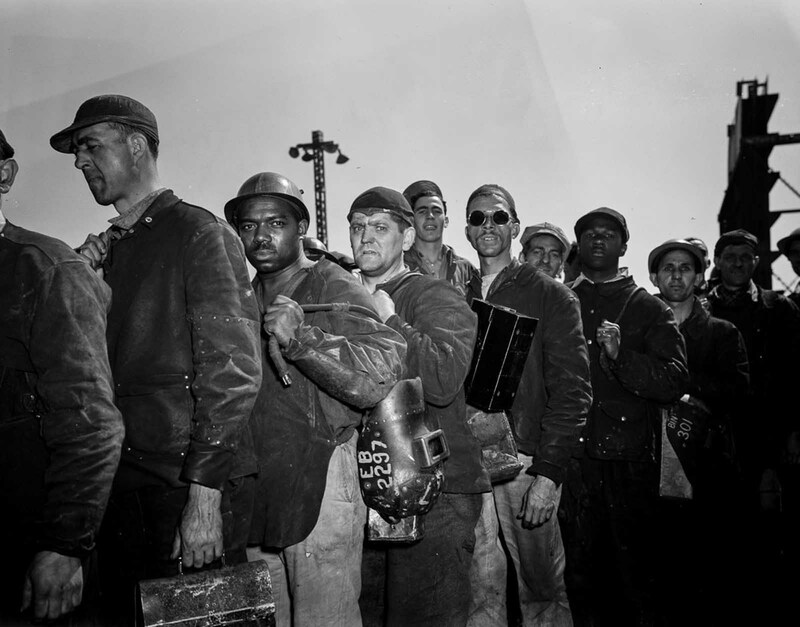 However, Liberties ended up doing well, plodding the seas for nearly 20 years after the end of World War II. Many Liberties were placed in the reserve fleet and several supported the Korean War. 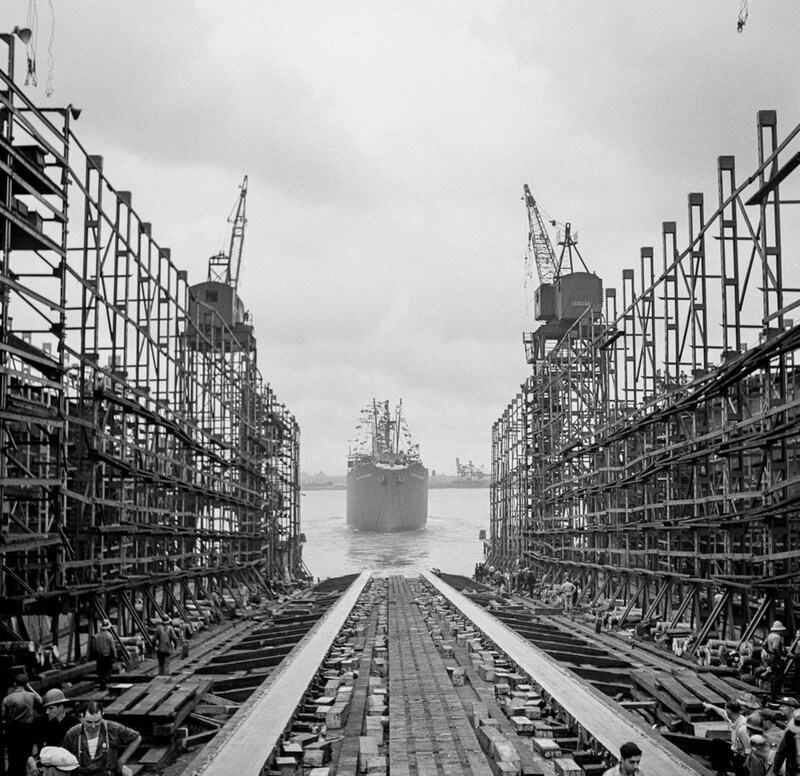 Other Liberties were sold off to shipping companies, where they formed the backbone of postwar merchant fleets whose commerce generated income to build the new ships of the 1950s and 1960s. Age took its toll and by the mid-1960s the Liberties became too expensive to operate and were sold for scrap, their metal recycled. 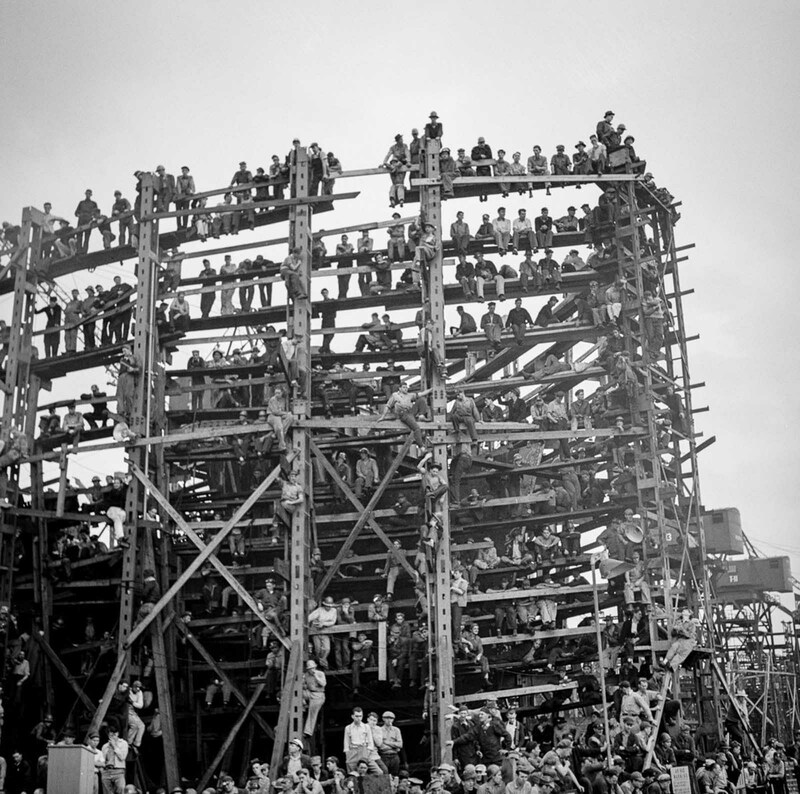 The first Liberty built, the Patrick Henry, was sent to the ship breakers (scrap yard) in October 1958. 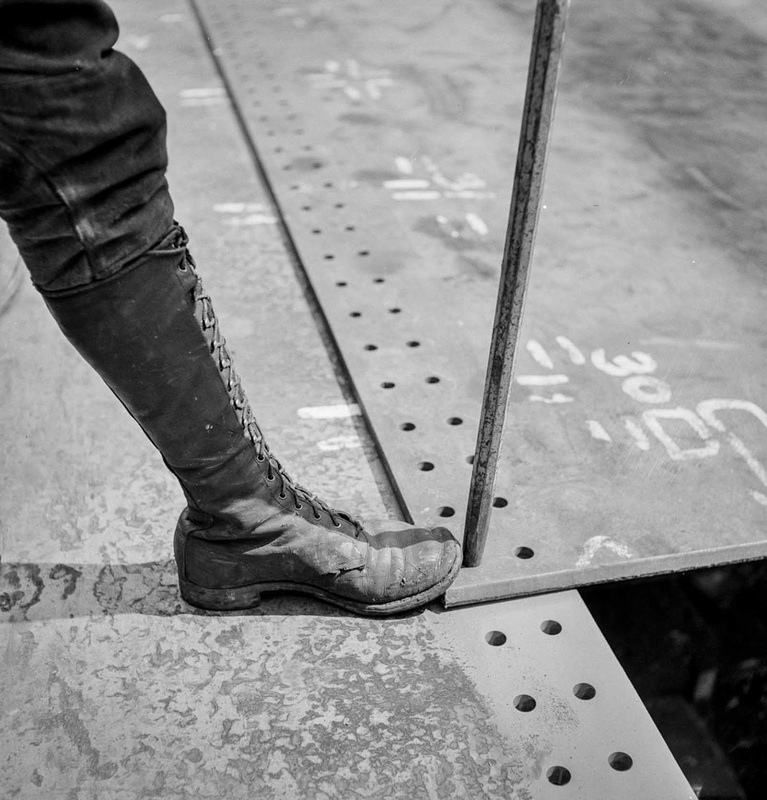 A worker welds a floor to a vertical keel. 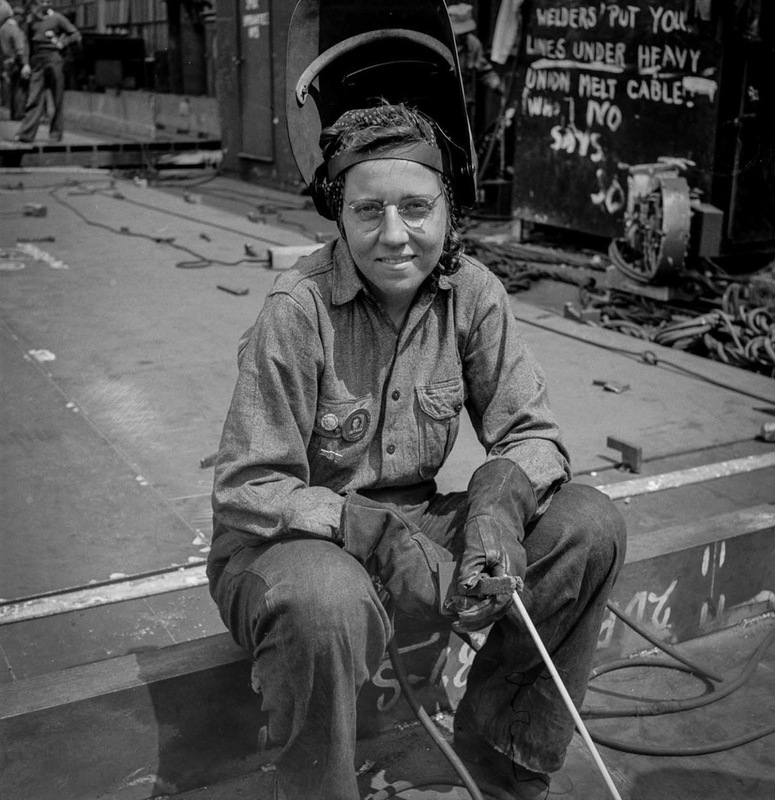 A chipper removes excess metal from a welded seam aboard the Liberty ship Frederick Douglass. Way No. 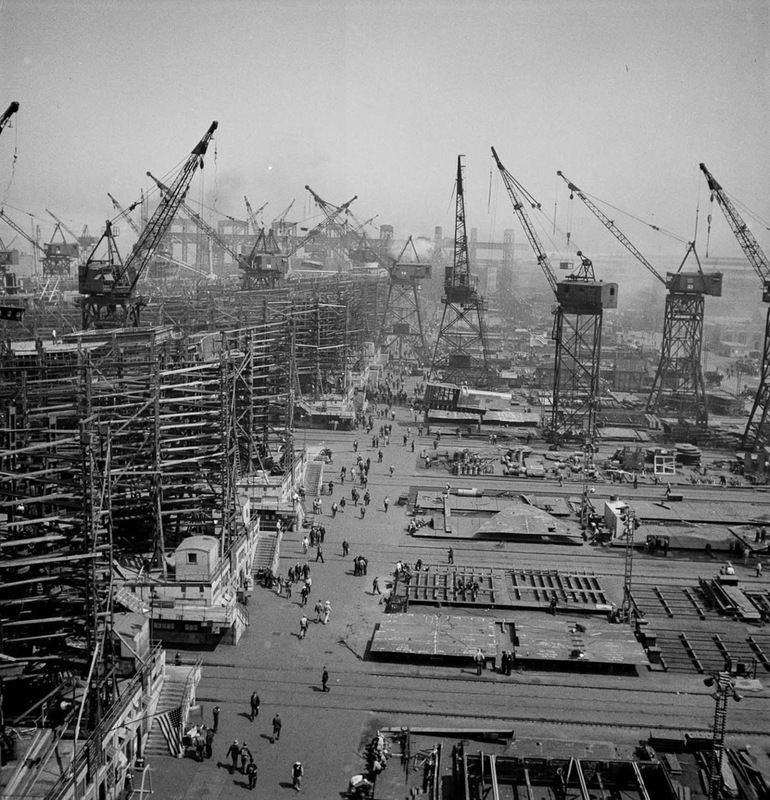 8 of the shipyard, with the Frederick Douglass in the early stages of construction. 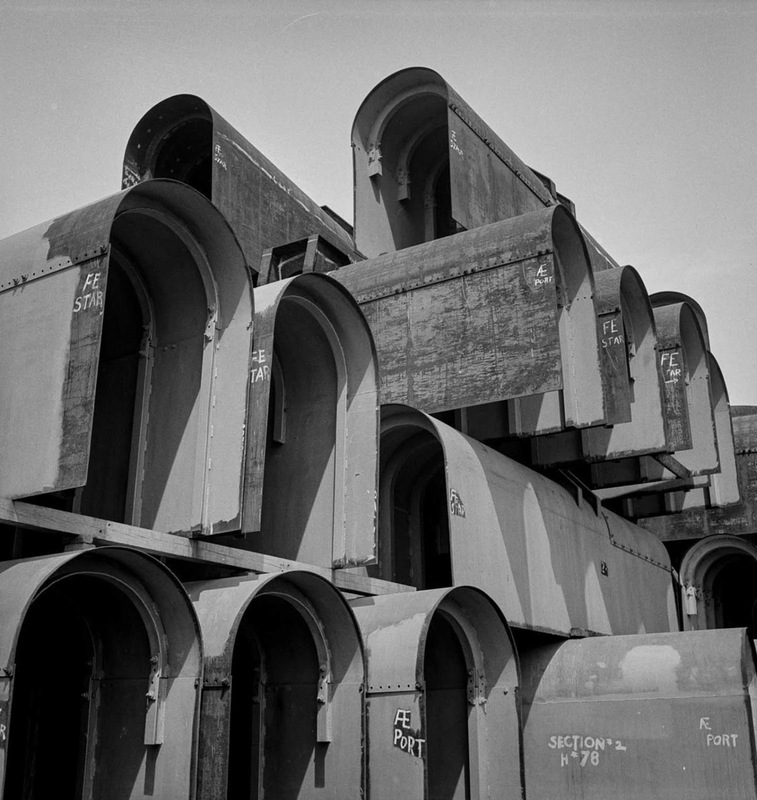 Storing miscellaneous bulkheads in a stockyard. Burning off excess steel plate. The bow of a nearly completed ship. 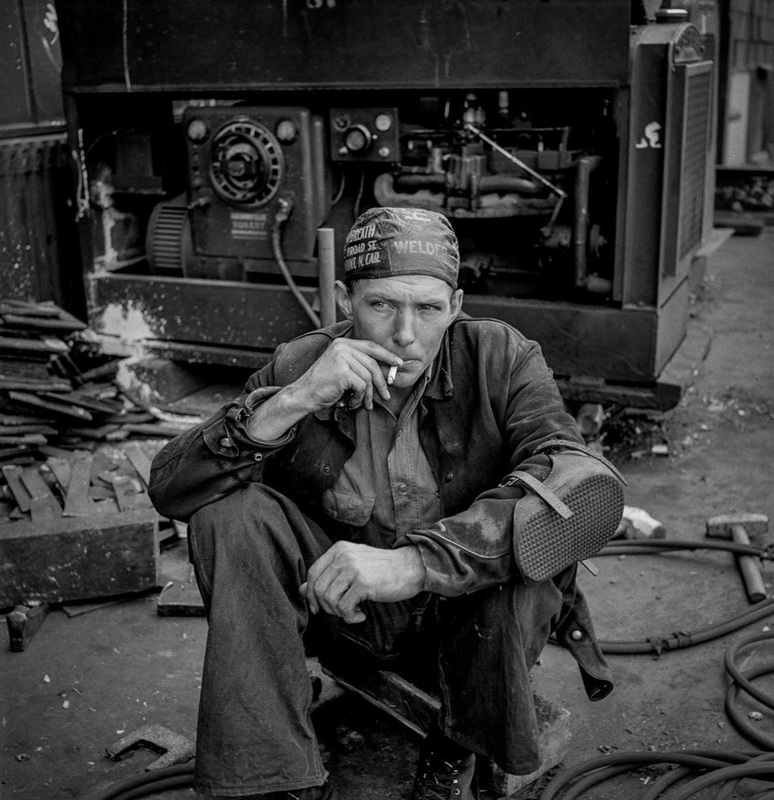 A welder rests during his lunch hour. 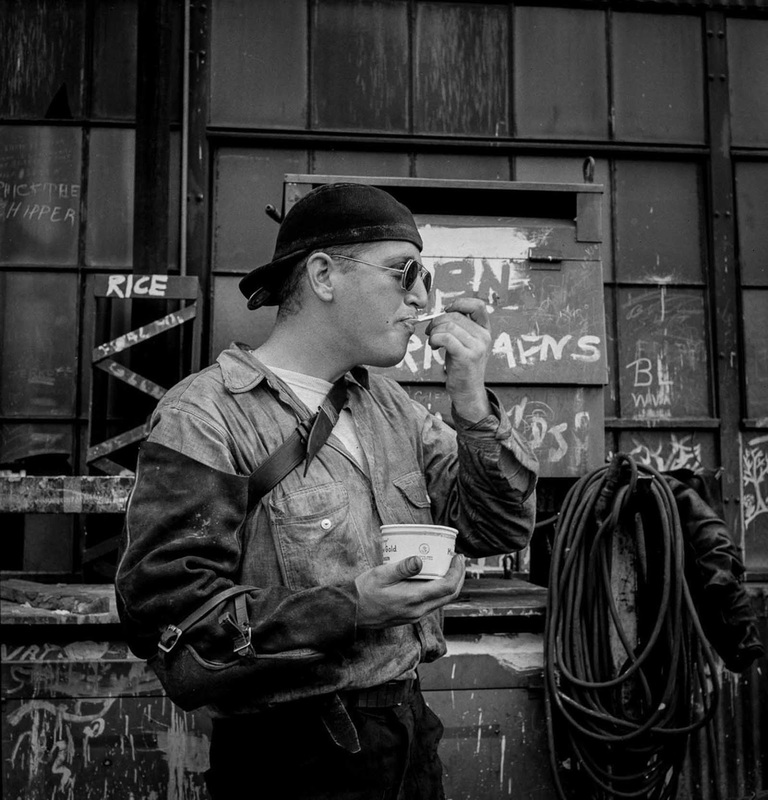 A welder enjoys some ice cream. 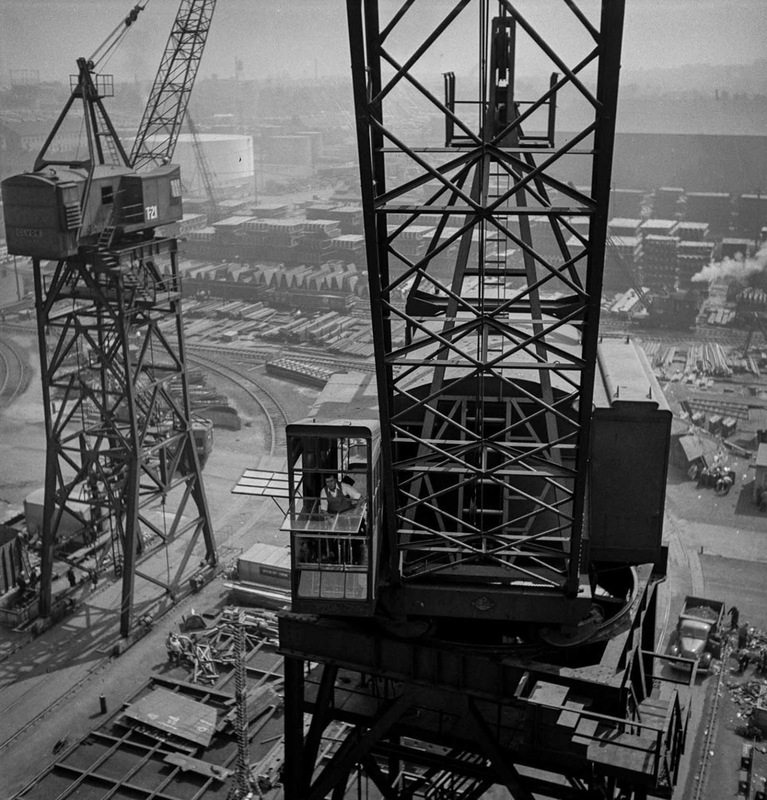 The crane and a view on the shipyard. 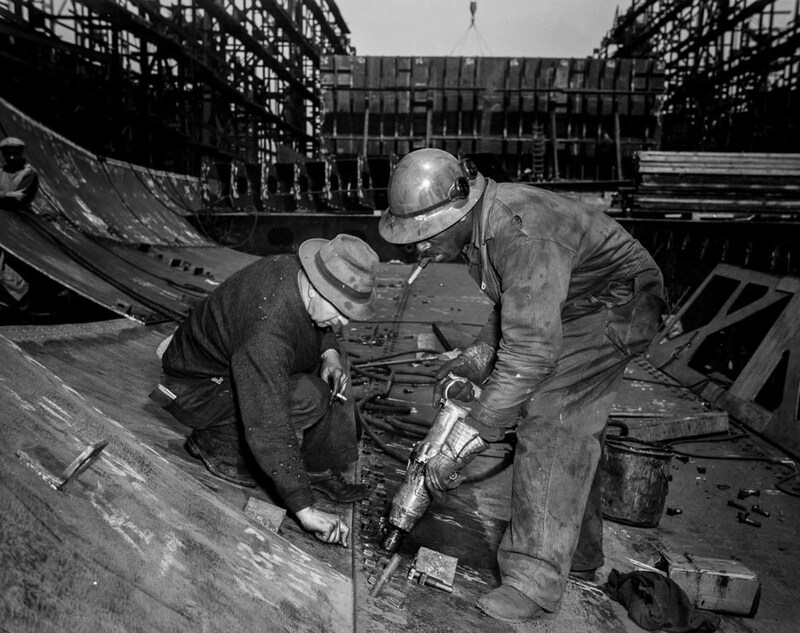 Workers tighten bolts with a pneumatic wrench in the belly of the Frederick Douglass. 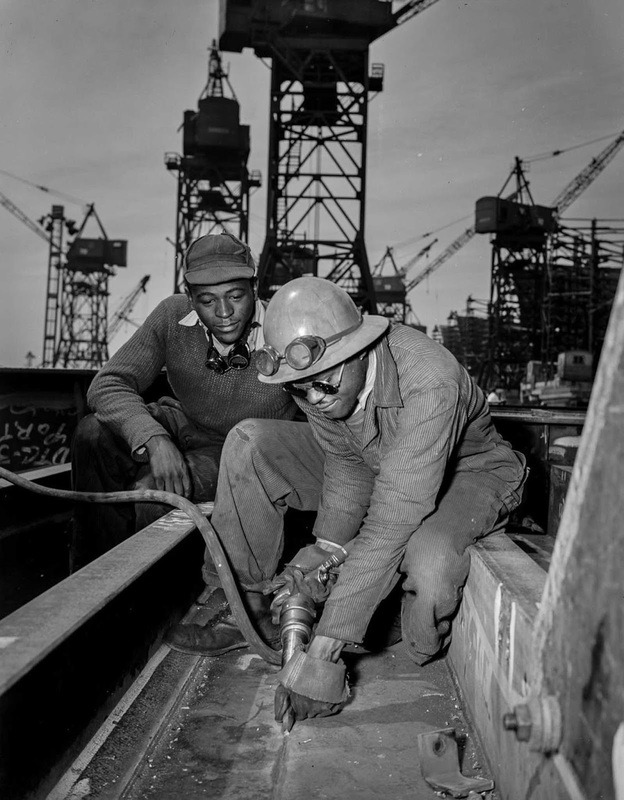 Men work on the Frederick Douglass. 1) Day 2: Keel plates are laid. 2) Day 6 : Bulkheads and girders below second deck are in place. 3) Day 14: Upper deck is in place. 4) Day 24: Ship is ready for launch. 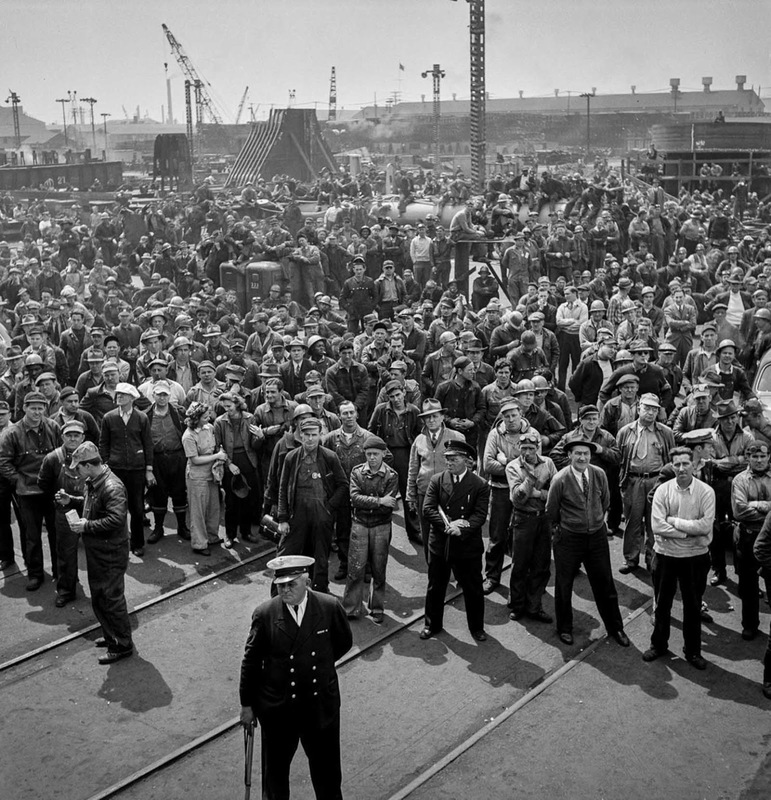 Workers gather for a ship launching ceremony. Workers grease the outboard end of a way before a launching. 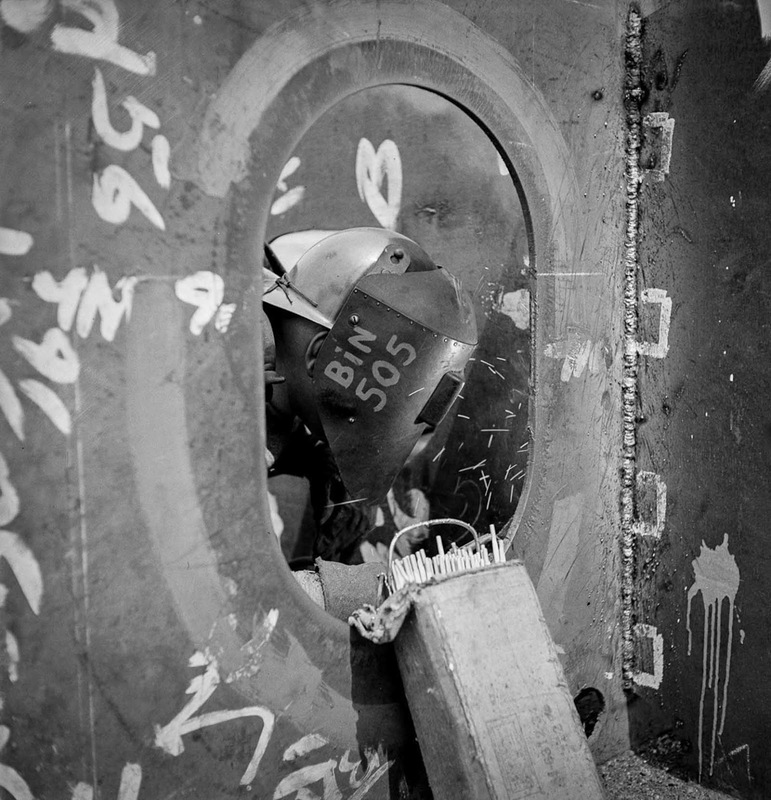 The bow of a vessel just before a launching party. The structure looks really strong. The SS John W. Brown is launched. This ship is one of only two Liberty ships remaining in operation today. 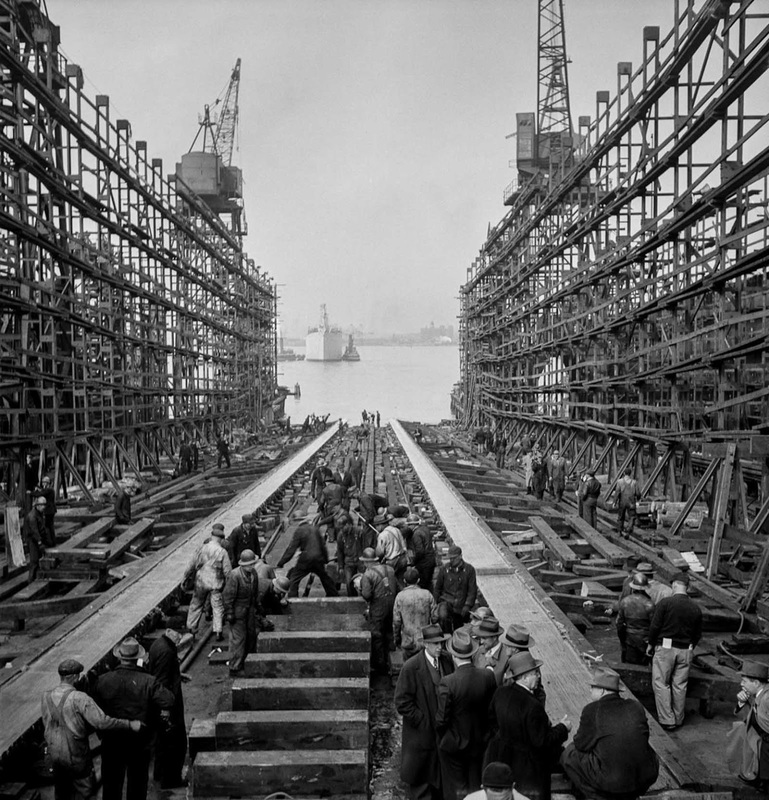 After a launch, workers fill the way and prepare to build another ship.